In our everyday culture, we communicate, consume, play, work, buy and give in digital ways at least some of the time, expecting an efficient and personalised experience all of the time. Algorithms. Artificial Intelligence. Augmented customer engagement. Big data/analytics. Blockchain. Cloud. Collaboration technologies for connected workers and collaborators. Cybersecurity. The current reality is that the A-B-C of being a relevant and resilient business is no longer as easy as 1-2-3. The ongoing digitisation of our world requires disruptive change in most organisations, and transforming to be fit for purpose is a demanding ongoing business and leadership challenge. Organisations need to consider whether the digitisation of “1-2-3” business-as-usual core capabilities and assets can strengthen existing business models. Institutions wanting to remain attractive, engaging and sustainable need to focus on developing new value propositions from digital and data innovations that customers and citizens want or need. Should your physical experiences, products and services be meshed with digital versions? Could your IP and data be released in innovative ways for extra value? Could your traditional value propositions be redesigned to meet new customer needs? Integrating the opportunities of digital into an organisation demands transformation across its whole. That’s because today, every business is a digital business. IT strategy can longer be separate from business strategy. Digital transformation is not about technology, its not purely about the IT. It is about growing the ambition to realise how digital can change strategy and introduce new ways of thinking about enterprise putting the customer at the centre. The Digital:Transformation Approach is an organisational transformation methodology for enterprises looking to transform and build adaptability to thrive in an environment continuously disrupted by new digital technologies, an approach created by Dr Hannah Rudman of Rudman Consulting. The Approach blends the methods of modern change management consultancy with action research; and utilises the tools, attitudes, and techniques of design thinking, and creative practice. Technology defines the “what” and “how” of digital transformation, but it is us humans who define the “why” of it: applying our human creativity, insight, wisdom, and empathy is essential, and is encouraged by The Approach. The Approach has been extensively used by Hannah and other change consultants with a range of over 250 organisations for the last ten years. It has been iteratively improved, integrating the learnings and experiences of enterprises that have transformed. 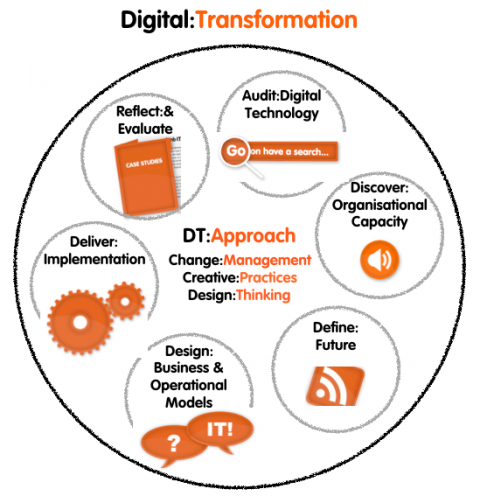 You can read and watch case study stories of the impacts and outputs of the transformation journeys already undertaken by enterprises through working with The Digital:Transformation Approach. Academic research has verified that 86% of organisations adapted at least two parts of their business to become digital, with 37% of these transforming all aspects of their business to become fully digital businesses. [Rudman, H., Benyon, D., and Hall, H. (2015). A framework for the transformation of the creative industries in a digital age. IFKAD 2015 10th International Forum on Knowledge Asset Dynamics Bari, Italy: Arts for Business Ltd, p. 1391-1403]. The Approach’s online toolkit is openly available and free to use, and has been specifically designed for organisations of any size, type and operational model – to enable any enterprise to approach digital development with confidence. So if you want to ensure your organisation is digitally fit enough to adapt to the constant disruption of continuously emerging digital technologies, then our an easy-to-use step-by-step approach to undertaking a successful digital transformation journey is for you! AmbITion programmes increased the legacy of work with organisations, by curating and sharing a rich resource of lessons learnt through the undertaking of digital developments, including How To… Guides, curated Learning Journeys through many digital development topics, and toolkits for the self guided learning of various digital development topics online. There’s also DT:TV – case study videos from enterprises that have undertaken change journeys, video on demand of past masterclasses and debates, video case studies of the results enterprises have seen, and video learning journeys through digital development topics. Rudman Consulting offers The Digital:Transformation Approach to enterprises and institutions of all scale and operational model, and nations and regions looking to establish change and development programmes for sectors needing to adapt and transform through the opportunities and threats of digital disruption. Contact us to find out more! The Digital:Transformation Approach has been the framework for a number of national digital transformation programmes, securing £millions public funding so far. Read more about them. It has also been licensed by global technology solutions company Leidos, and BOP Consulting.